I picked up my first Mast Brother bar of chocolate at Whole Foods the other day and decided to use some of it to make hot chocolate! I usually make my signature hot chocolate with Bernard Callebaut cocoa powder and honey, but a chocolate bar works just as well. It was also really hard to break the beautiful packaging from the chocolate! Seriously the Mast Brother's have the nicest chocolate wrapping paper. Ever. 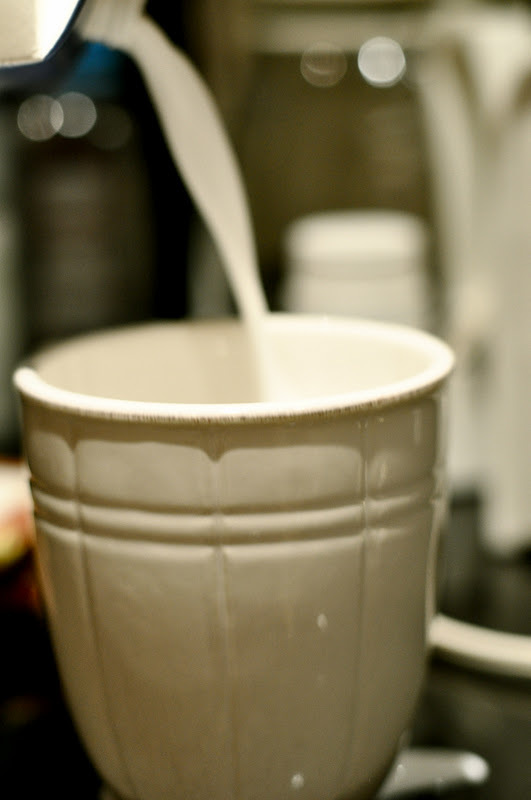 To start, I used a mug to measure out exactly how much milk I wanted for one serving. 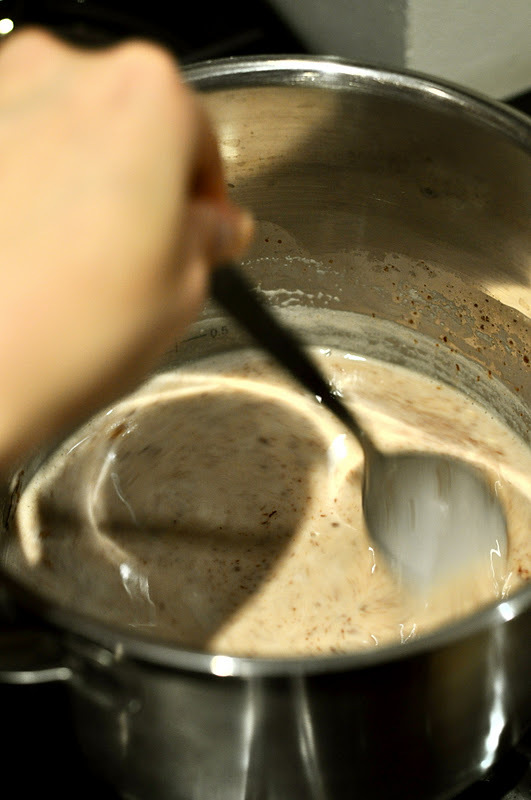 Then I poured it into a saucepan and put the burner on medium-low heat and added a few chunks of chocolate. Add more chocolate to your taste, you also may need to add another sweetener like sugar or agave syrup if you think the chocolate is too bitter (this one was 74% cacao). I also used coconut milk instead of normal milk which I find has a nicer taste than soy, and has a thick, creamy texture reminiscent of whole milk (but a bit healthier!). Stir the chocolate till it melts and blends fully into the milk, and voila! 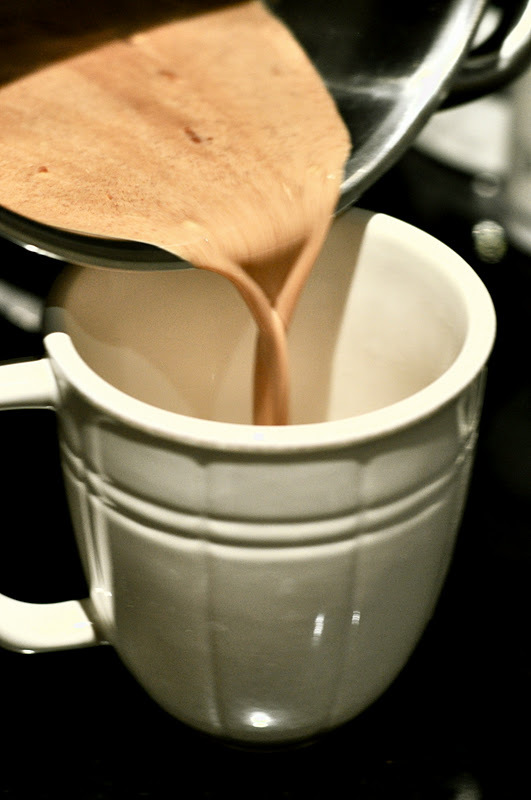 Delicious hot chocolate! oh my god this looks freakin' amazing!!!! With coconut milk too!?!?!??! Drooling. Oh yes! I absolutely love these chocolates as well! I seriously just drooled. That looks insane! Thanks for sharing!! This is such an interesting blog! Very nice. i never thought of using a chocolate bar before (i'm usually the swiss miss type :/ ) but i really want to try it out now! this looks delicious! you've inspired me to make one right now although I only have dairy milk chocolate it will have to suffice. Genius idea. Why haven't I thought of this before now? Your hot chocolate pics are making me want a hot drink RIGHT now!!! I'm actually going out to get one! I'm salivating!